The perfect solution for modern minimalists seeking sturdy and durable mattress support! Featuring super strong steel slats, our platform base are unbeatable in its strength, stability and level support for your traditional heavy mattresses, memory foam, hybrid mattress, etc. Twin Size(inches): L77.4"×W40.4"×H14", For Mattress Size L75"×W38"
Reinforced Waterproof Package prevent transportation damage and missing parts. Delivers revolutionary sleep products conveniently to your front door via FedEx/UPS. Easy Assembly within 30 minutes and only 4 steps, No additional tools required(Easy Installation Kit Included). Please Check the Product Instruction and Parts before Installation. If you have any question, please feel free to contact us at Service45Min@hotmail.com. 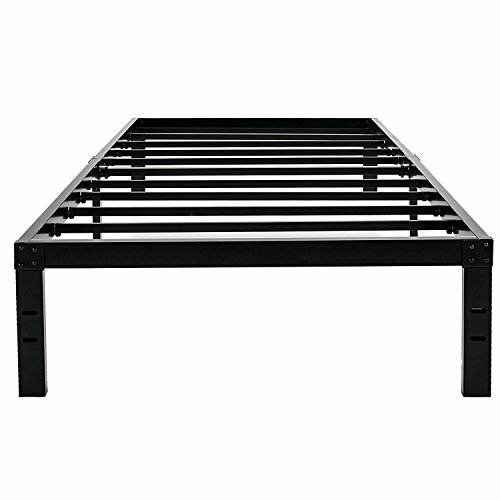 [3500lbs Heavy Duty] Ultimate strength and durability, 2.4-inch thick steel frame design, 20% stronger&heavier than similar bedframe. [Stability System] Reinforced leg structure and Integrate structure make the whole structure much safer & firm, quiet noise-free, non-shake and prevents structural twisting. [Non-Slip Design] The frame encloses the mattress to prevent slipping, multiple points bed-legs and tough square steel slats give good support, doubles the mattress' life expectancy. [Under bed storage] 14 inches high bed frame not only providing a ton of room for storage under the bed, but no more sagging box springs. If you have any questions about this product by 45Min, contact us by completing and submitting the form below. If you are looking for a specif part number, please include it with your message.